One winter Monday, 15 or so years ago, I arrived at work to some devastating news: Over the weekend, a coworker had lost her home to a fire. We all huddled around the coffee pot in the break room, trying to imagine—although we knew we couldn’t—what it would be like to lose almost all of your earthly possessions. A week later, when our colleague Chris returned to work, we began the slow process of bearing witness to her shock and grief. Then, months later, we were her empathic-yet-fascinated audience as she told stories of the new house rising from the ashes—not just being built, but also being populated with new things. I was only in my late-20s and had accumulated relatively little, yet I couldn’t fathom what it would mean to start completely over. There would be the lack of pillowcases, cake pans, and familiar sweaters waiting for you as fall settles into winter, but also many harder-to-replace things: No rows of books with penciled notes and cardstock bookmarks identifying the shops where the books were bought. No wedding gifts that, each time you use them, bring to mind the great aunt or college friend who bestowed them. No outdated lamps from your childhood, handed down to you as you entered adulthood with so little. Chris was in her late 50s, so the home she lost had contained decades of memories and treasures. While her new home was being built, Chris told us about the interior decorator, who specialized in “recreating meaning.” I was utterly fascinated by—and skeptical of—the process, which involved interviewing Chris and her husband to gather meaningful family stories and tales of travel adventures—references she would then bring into the new home through new objects. I never would have dared to ask Chris, but I always wondered: Did it work? Can a home speak in retrospect of a life lived, or must the life be lived into the home? I suppose the question needled me because it touched on an area I had dabbled in myself—but in reverse: I, as a newly married 22 year old, had attempted to use objects in my home to speak into my story. I didn’t know what my life would be like, but I knew what I wanted it to look like. If I built the stage, would the life follow? 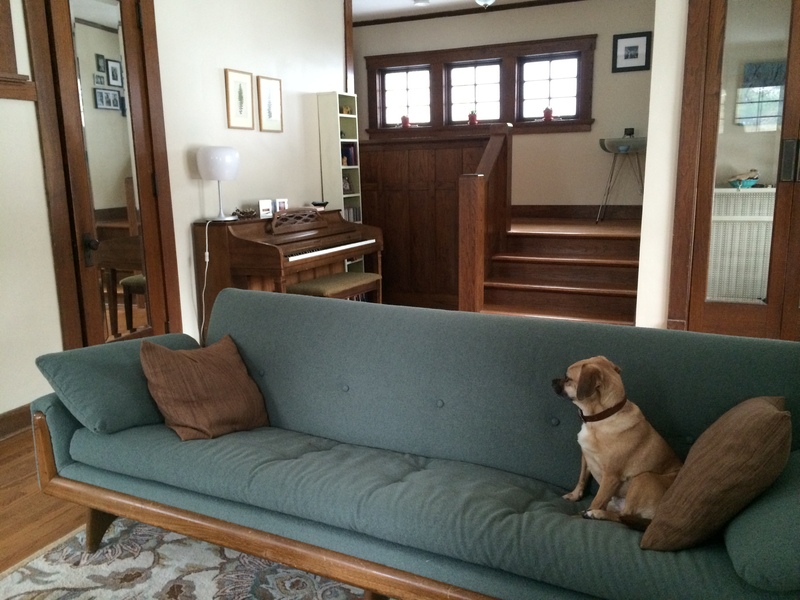 Garage sales, thrift shops, and odd pieces of loaned and handed-down furniture created the kind of comfortable, quirky, space-with-a-history that I longed for. My husband was a painter, so the walls were filled with art (indicating that we were “creative” and “interesting,” of course!). A set of handmade pottery dishes, given to us as wedding gifts, conveyed that we were “down-to-earth” and “simple”—no fine china for us! And we rushed to buy books to fill the shelves—more books than we could possibly keep up with. It would take us years to actually read and absorb their stories and ideas, but that wasn’t the point. I wanted to be instantly surrounded by these visual symbols of intellect and depth. In short, I wanted everything in my home to tell a story about us, but I was too impatient to let the stories emerge on their own. Now I know the answer to the question I wanted to ask Chris so many years ago: A life must be lived into the things that fill a home—it can’t be put on, like a costume. My home today (the eighth of my adulthood homes) is filled with evidence of a life that’s been both beautiful and complex. Yes, the books, art, furniture, and dishes each have stories to tell, but they are not all happy stories. They tell stories of a broken marriage as well as stories of wholeness and healing. They bring to mind the struggles and triumphs of single motherhood, as well as the ongoing tales of blending two families into a new one. My eyes scan the rooms visible from where I sit at my desk. There’s the dining room table—the same table my ex-husband and I sat at four homes ago, a highchair pulled up so we could spoon food into our daughter’s mouth. Now, during dinners at that table, Jason and I navigate the tumble of tales and ideas shared by our three teenage daughters. I can also see the vintage sofa I happily snatched up as a single mom about to move into a rented duplex. It’s the same sofa I sat on to read books to my young daughters, but it has since been reupholstered (following an unspeakable incident with the family dog). Behind the sofa is the piano I grew up hearing my grandmother play; she gave it to me when it was time for her to move into assisted living, and time for my daughters to learn to read music. 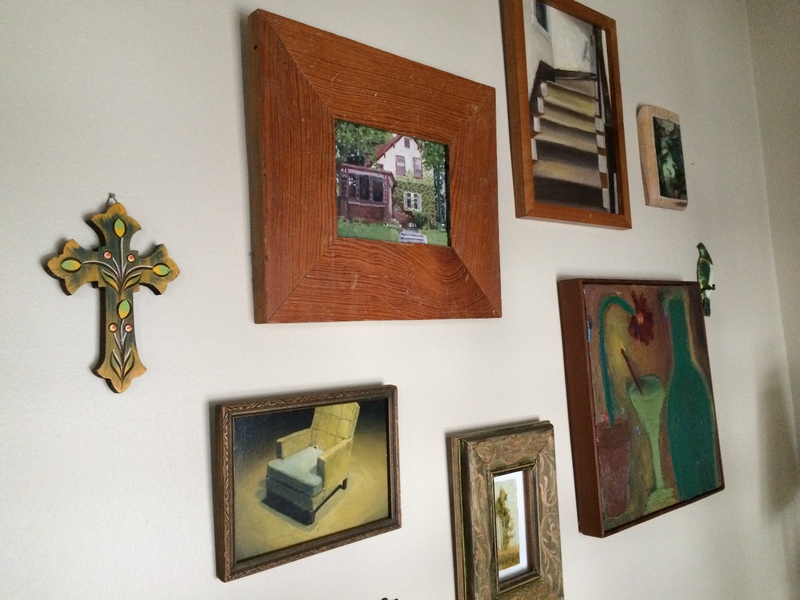 And beyond the sofa and piano, just inside the front door, is a gallery wall of small artwork and treasures. An olive-wood cross, carved and painted in Santorini where Jason and I honeymooned, hangs just to the left of a painting my ex-husband made of the house he and I lived in when our daughters were born. Suddenly, I can see my home for what it is: not a collection of aesthetic choices I hope will communicate something appealing about me, but vessels holding the real stories that have emerged in my life. And that gallery wall in particular? It also symbolizes my acceptance of those stories—the intentional, beautiful stories as well as the haphazard and heartbreaking ones. Together, they speak truth: Welcome to my home, welcome to my life. I’m sure that my home is here somewhere under all of this stuff, and so I sit in my attic bedroom and try to imagine it. There. There is a chair under that mound of coats, smuggled upstairs for a Christmas Eve party (oh, the appearance of first-floor cleanliness!) and never returned. Next to the chair is “my” desk, which is a bit of a joke around here. I can barely see its edges under the wrapping paper, tape, and children’s art supplies that show up as soon as I create a clean surface. How many markers-without-caps can one family collect? I’ll let you know once our experiment is complete. The bins of kid clothes are stacked in the corner, over-flowing with the next season and the next size. Our oldest daughter has grown an inch in two months and I vaguely remember setting aside extra-long pants in September. But which bin? I’m not sure, but I do know that I’m not up for the search right now. And then I remember. “It doesn’t matter,” I exclaim, “because it’s boot season!” The blessed boots will cover her ankles until I find those pants. 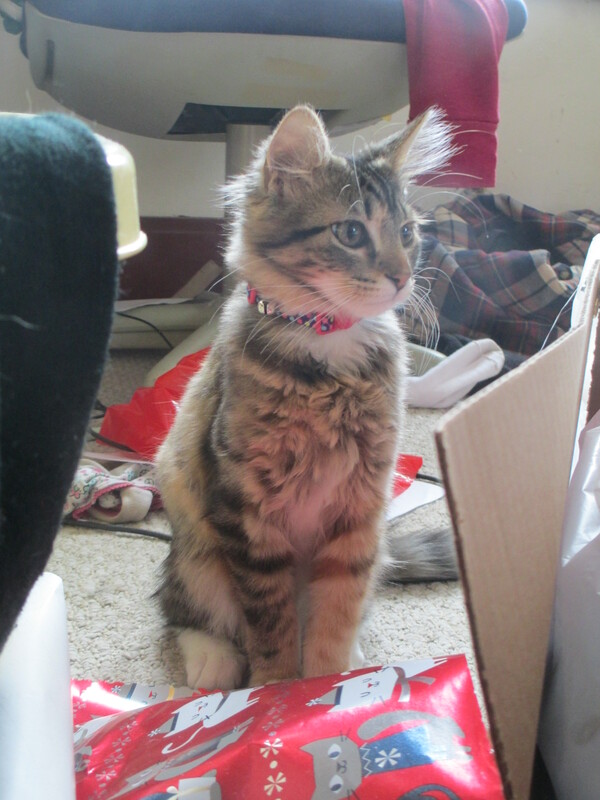 Our brand-new kitten bounds up the stairs, and I sigh-and grin- as she pounces into the room. Who gets a seven-year old a kitten for her birthday? Crazy people, that’s who. Our two older cats awake and glare from the bed. They are not amused. I can hear her tiny collar bell jingling as she weaves her way through the piles, enjoying the tunnels and hiding places that all our stuff creates. On the second floor there are hurried footsteps and I hear our housemates’ bedroom door open and -slam!- as the kids head for the bathroom, trying unsuccessfully not to wake their parents. Their loud whispers are a familiar morning sound. Our two families have been living together for almost three years now, with four kids (now ages 7, 6, 5 and 5) between us. Currently their family of four is living in one bedroom, as they prepare to move into a newly renovated house down the street and we make room for my newly arrived brother-in-law. The kitten hears the kids-now all four are awake-and she leaves her grumpy sentinels behind, tumbling down the stairs toward the sound of laughter. The kids are beside themselves because there is a two-hour snow delay. “Two more hours to pla-ay!” one of them sings, and I hear the kitten’s bell as she joins the party. I head for the kitchen, passing the piles of clean, unfolded clothes and trying to calculate when I’ll have time today to “finish” this endless task. Suddenly, I remember that the piles will not always be there. Suddenly, I remember that home is a seasonal place. I think of the kitten tunnels, the ever-growing kids, and our parade of housemates, transitioning in and out, but always leaving their mark. “And it’s good,” I declare over the laundry, “very good.” And in this moment I believe it. In this moment, just for a brief moment, I settle into my life as it is today. Here. Now. And not forever.